Increase their speed to quickly clear the intersection. Continue driving through the intersection without stopping. Stop when a traffic signal is red. Remain stopped at a steady red light until the signal changes to green. No left turn can be made here. A left turn can be made only after stopping. All traffic must turn right at the next intersection. 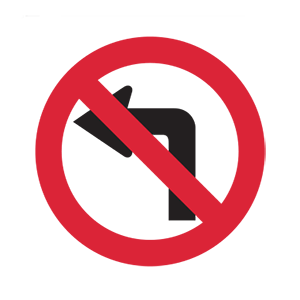 Signs with a red circle and diagonal line over a black symbol indicate that the action represented by the symbol is prohibited. In this case, the sign indicates that left turns are prohibited. Disappear into blind spots or are so close that they restrict the truck driver's ability to stop and maneuver safely. Have sufficient space to travel behind the truck. Have several car lengths between their vehicle and the truck. "No zones" are areas around trucks or buses in which cars disappear into the larger vehicle's blind spots. "No zones" can also be defined as areas in which cars are so close to the larger vehicle that they restrict the truck or bus driver’s ability to stop and maneuver safely. A car being in a "No zone" greatly increases the potential for a crash. Stare directly in front of their car. Only focus on the middle of the road. Watch beside, ahead, and to the rear of their car. A driver should watch beside, ahead, and to the rear of their car. To be a good driver, you must know what is happening all around your vehicle. Slow down and proceed through the intersection without caution. Stop before entering the intersection, if you can do so safely. 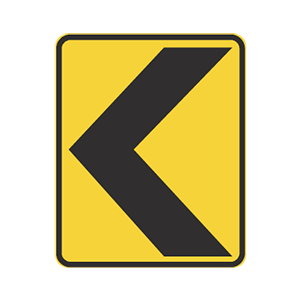 A solid yellow light means "caution" and signals that the light will soon turn red. You should stop at a solid yellow light if you can do so safely; otherwise, you should cautiously cross the intersection.